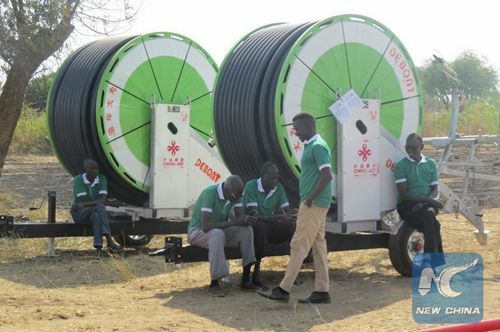 Chinese firms are providing financial resources, technology and expertise that are helping South Sudan develop a vibrant oil industry and boost export earnings, a government official said. Ezekiel Lul Gatkuoth, South Sudan's minister for petroleum, said that strategic engagement with Chinese firms like China National Petroleum Corporation (CNPC) has enabled the world's youngest republic to boost oil production. "When I came here in August 2016 as minister for petroleum, we had decided to work together with CNPC, to maintain and increase production in block 3 and 7, now the production is going up," Gatkuoth told Xinhua during a recent interview in Juba. "We are now producing 135,000 barrels a day and we are going up. The oil price is increasing, it is stabilizing and that is good for us and the partners," he added. The former diplomat hailed CNPC for retaining its oil operations in South Sudan despite jitters caused by more than five years of civil strife. "In 2013 when we had a crisis, CNPC did not leave the country and continued to operate oil," Gatkuoth remarked, adding that the Chinese oil giant has strengthened bilateral ties between Beijing and Juba. CNPC formally entered into South Sudan's oil sector in 2011 and has assisted in the development of infrastructure required to drill, refine and transport the commodity. Gatkuoth said a partnership with the Chinese firm has fast-tracked revival of dormant oil fields leading to a spike in production levels. "Blocks 1, 2 and 4 where CNPC is have been dormant for the last five years and it took 45 days to resume their operations. They are producing 22,000 barrels of oil per day and by the end of this year, we are going to hit 60,000 barrels," said Gatkuoth. He revealed the government of South Sudan has signed a memorandum of understanding with CNPC to help develop new oil fields. Gatkuoth said Juba has rolled out policy and regulatory incentives to encourage foreign companies to invest in its oil sector that is key to economic revival and infrastructure development in a country that is reeling from half a decade of civil strife. "We have the best investment law in this country. All the materials for investments in the oil sector are tax exempted," said Gatkuoth, adding that improved security is expected to boost investments in South Sudan's oil industry. The minister said the next phase of bilateral cooperation between China and South Sudan will place emphasis on development of infrastructure and energy. Gatkuoth said Juba will harness revenue generated from oil to develop critical infrastructure like roads. "We will be allocating 10,000 barrels per day for infrastructure development," said Gatkuoth, adding that Juba has engaged a Chinese firm to build new roads.